The previous time I visited Cielo Restaurant & Bar at the Four Seasons in St. Louis, I tasted an “unusual Margarita.” While it wasn’t a Margarita I particularly liked, I wasn’t going to shy away from trying whatever Margarita they were showcasing, as they were highlighting a variety they called the “Barrel Aged Margarita”. The menu listed the ingredients for the Barrel Aged Margarita as aged tequila, big o ginger liquor, dry curaçao, lime, and grilled orange. Certainly these ingredients sounded interesting so I was happy to give it a shot. Unfortunately while lime was specified, it was hard to discern any lime flavor. 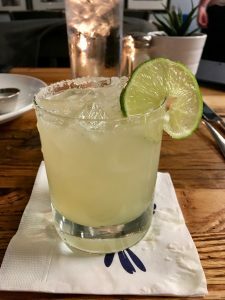 It did have good tequila flavor along with ginger and curaçao that blended together nicely, but without a good lime component, it falls a little short on my scale as a Margarita. As with the other Margarita I’ve had at Cielo, this was certainly not a traditional Margarita, but it was a nice drink regardless. I rate the Barrel Aged Margarita at Cielo a 7. Olive & Oak is a new restaurant in the Webster Groves area of St. Louis. It has quickly gained a great reputation so far for quality food and drinks and on this visit I can verify that their food was quite excellent. But you’re reading this article because you want to know about their Margarita, right? 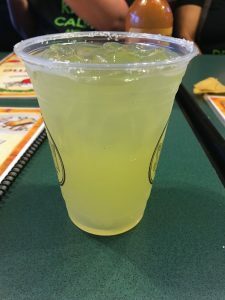 My impression of the Margarita I had this visit was that the flavor was good and seems to be made with fresh ingredients. However, the tart and sweet flavors don’t seem to balance quite right. Instead of complimenting each other, it feels like they are separate and “fighting” with each other. The initial flavor hit is a bit fruity and the finish was a little bitter. However, it did have good lime and tequila flavor, being made with Tres Agaves tequila. Overall I would rate the Olive & Oak Margarita a 7 for this visit. But I’m certainly eager to come back and try another Margarita to see if they can do better! My wife had visited a fairly new restaurant in the St. Louis area called Il Bel Lago with a friend and wanted to bring me. 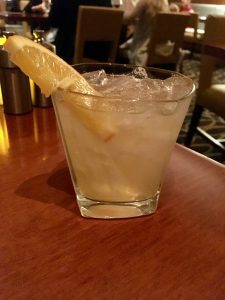 As an Italian restaurant, I wasn’t necessarily expecting a good Margarita, but the place was classy and seemed like they had an excellent bar. On the menu was something called an Italian Margarita so I of course went ahead and ordered one. 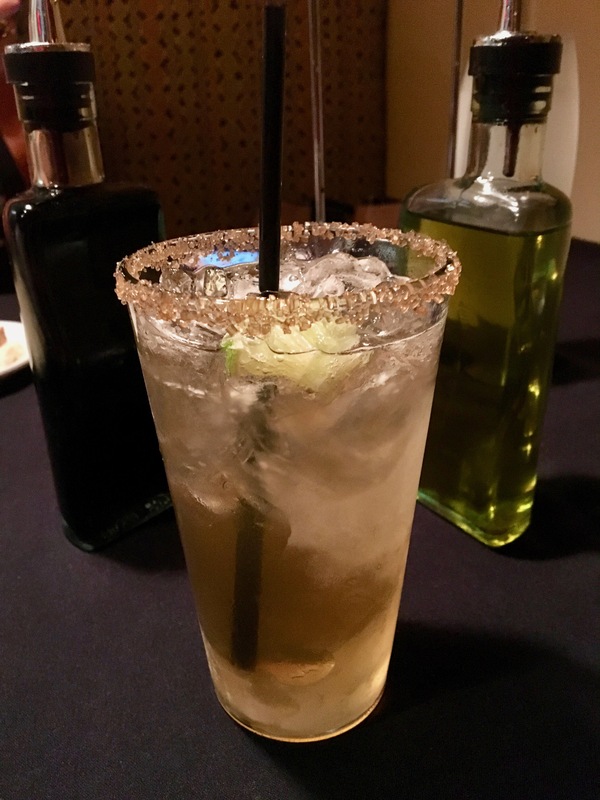 The main difference between this “Italian” Margarita and a standard variety was the inclusion of Amaretto liqueur. Now personally I am a big fan of Amaretto and I make a nice Amaretto Sour with fresh lemon juice and a touch of agave nectar. 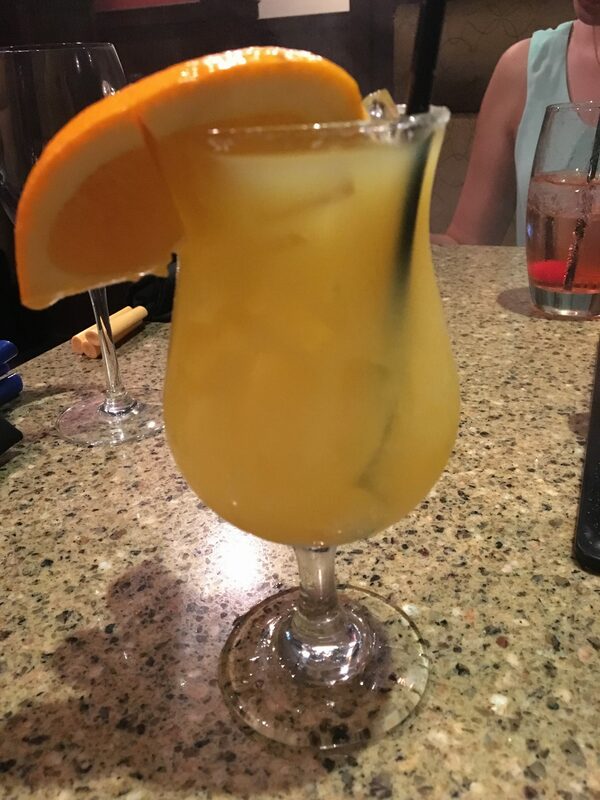 But how would it work out in a Margarita? At first taste, the blend of fresh lime and citrus with amaretto was a little strange, but it quickly turned into a pleasant blend of sweet and tart flavors. The more I drank it, the more I liked it. Helping out the overall enjoyment of the drink was the fact that the bartender Angie came and talked to us and explained how she makes the drink and shared some of her tips and tricks. She definitely is a skilled bartender and offered a lot of knowledge on Margaritas and other cocktails. Now a Margarita made with amaretto liqueur may not be your thing, but I personally liked it and rated the Italian Margarita from Il Bel Lago an 8. 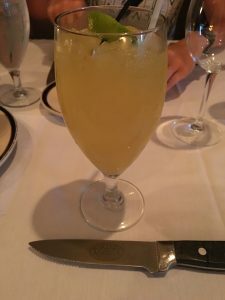 I’ve written about the Margaritas at Porter’s Steakhouse before. So when I got an an opportunity to eat there again, I also took the opportunity to have another Margarita. While last time the Margarita garnered an 8, this time unfortunately, the Margarita was not quite as good. The flavor was fairly good but it was a little too tart. The tequila flavor was good, but overall it tasted like it was made with a mix. I believe that if I had specified the ingredients, Porter’s would have delivered a better Margarita, but for this visit I rate it a 7. Which just goes to show that it is difficult to judge how good an establishment’s Margaritas are because a lot of the time the quality will depend on the bartender’s skill and particular recipe they may use. This is why it is important to visit a place many times to make sure to get a broad range of samplings. Yes, it’s hard work, but I’m happy to shoulder this burden for all of you! My family visits The Melting Pot quite often. 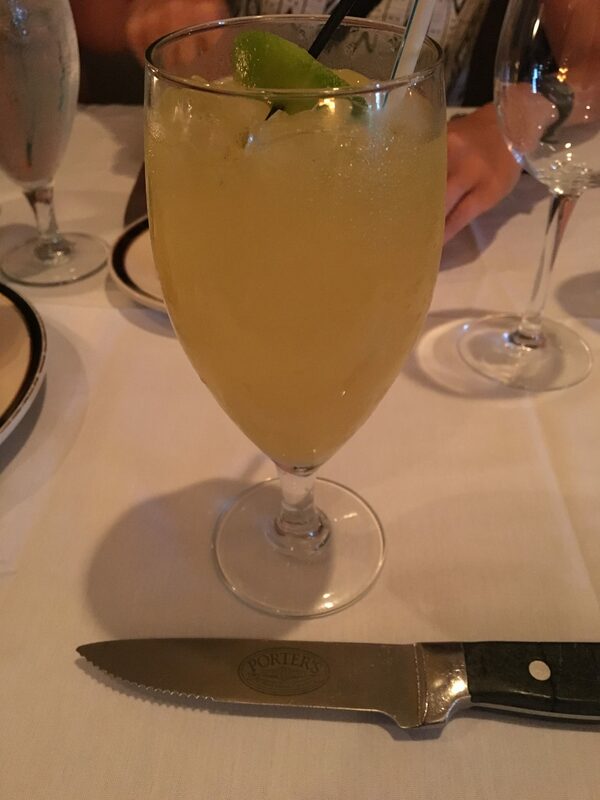 I usually like to sample one of their cocktails, especially if they are offering a new variety of Margarita. On this visit I noticed they were in fact highlighting a new drink that they called the Freshly Picked Margarita. The ingredients listed were Avion Silver Tequila, Solerno Blood Orange and Cointreau orange liqueurs, agave nectar and fresh lime, lemon, orange, and grapefruit juices. With ingredients like those, I knew I had to try it. Unfortunately, the combination of ingredients just didn’t quite work out to make a good Margarita in my opinion. First, the initial flavor hit was a bit bitter. The tequila flavor was good but there was not enough lime flavor. The orange and grapefruit flavors were quite a bit more prominent instead. While it was an overall good drink, the fact that the flavor profile is much more orange than lime strays away from what I would call a Margarita. Because of that, I only rate this drink at a 6.5 as a Margarita. However, as a general cocktail, it probably deserves higher marks so if you like a Margarita-like drink with more orange flavor, this might be your thing. For our final stop on my second Margarita Run, we stopped at a place called Chaparritos Mexican Restaurant. Unfortunately, the Margarita we had that night was a bit fruity tasting. It tasted nice overall, but I would prefer more citrus and tequila flavors. At least it did have a nice finish and was refreshing. I would rate our final Margarita of the night a 7. So this wrapped up Margarita Run II in St. Louis. Overall I would say that I was expecting more out of the Margaritas in the various Mexican establishments on Cherokee Street. None were really bad, but none really stood out as a Margarita I would consider anywhere near the best in the city. Perhaps the establishments all were gearing their drinks to satisfy the multitude of gringos that visit and maybe they have special Margaritas for those in the know? If so, I’d like to find out how to get some of those! Until then, I’ll keep searching for the Ultimate Margarita.